Blu Mar Ten wrote: Could really do with AEV on spotify now tbh. If anyone has any influence, please make this happen. oh this is odd. 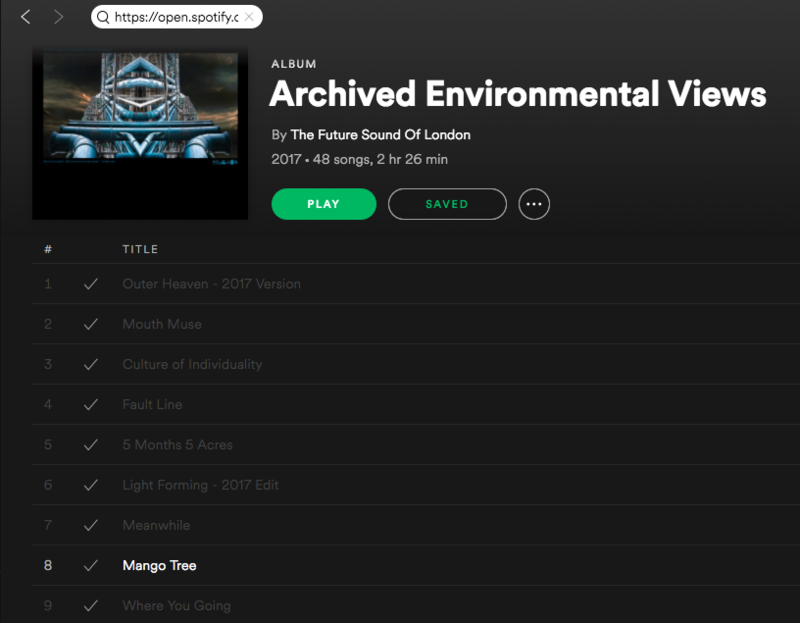 AEV doesn't appear on spotify as an LP on fsol's artist profile, but if you google it you can find a spotify link to the LP - https://open.spotify.com/album/4lasIwFq1EOGnMPOK9Z3ZH. seems the only way you can open the LP in the spotify app is by pasting that link into the spotify search bar. but the entire tracklist except 'mango tree' and 'lizard crawl' is greyed out. I'm presuming (It's just a guess mind!) that as Lizzard Crawl & Mango Tree were on the original 'From The Archives' on the Jumpin' & Pumpin' label they've got the license from those guys. Whereas the others are on fsol's own label and I know Garry is not a fan of Spotify's payment ethics. mcbpete wrote: I'm presuming (It's just a guess mind!) that as Lizzard Crawl & Mango Tree were on the original 'From The Archives' on the Jumpin' & Pumpin' label they've got the license from those guys. Whereas the others are on fsol's own label and I know Garry is not a fan of Spotify's payment ethics. no doubt. what's weird about it is that it would need to be given to a distributor to even appear on spotify. Not sure how it appears like this without being listenable. Confusing stuff. I'd imagine their digital distributor deals with iTunes etc. too. From what I remember, it went up on Spotify shortly after release, then Gaz was annoyed as they'd specifically requested it wasn't on there, so it went down a day or two later. This is probably that page. finally picked this up. ace.